That poor woman should get herself some tattoos. Or some dental fillings. Ace Double, eh? What’s the b-side? @Deadstuff: http://people.uncw.edu/smithms/F-series/F-261.JPG This is the middle of a trilogy by Delany, who had to finish his paper-round and do his homework before writing a stand-alone novel the following week. The other two volumes got similarly rough handling http://people.uncw.edu/smithms/F-series/F-199.jpg by Jack Gaughan those two times, instead of getting Emshed. Delany later mischieviously dedicated his wilfully un-illustratable ‘The Einstein Intersection’ to Gaughan ‘for what is without’. The other dedicatee is the guy who lopped 1/3 out of each book in that trilogy. Oops! This is the other one http://people.uncw.edu/smithms/F-series/F-173a.jpg the answer to the quetion on the cover is ‘yes’, and the B-side here was one of James White’s ‘Sector General’ books. HE’s a cyborg with a wandering eye*. SHE’s an invisible diva with a flair for the dramatic. When they move into 21B, will the TOWERS OF TORON ever be the same?!? The Emperor’s New Wife served to distract attention from the *other* elephant in the room. I wish her clothes would go away. 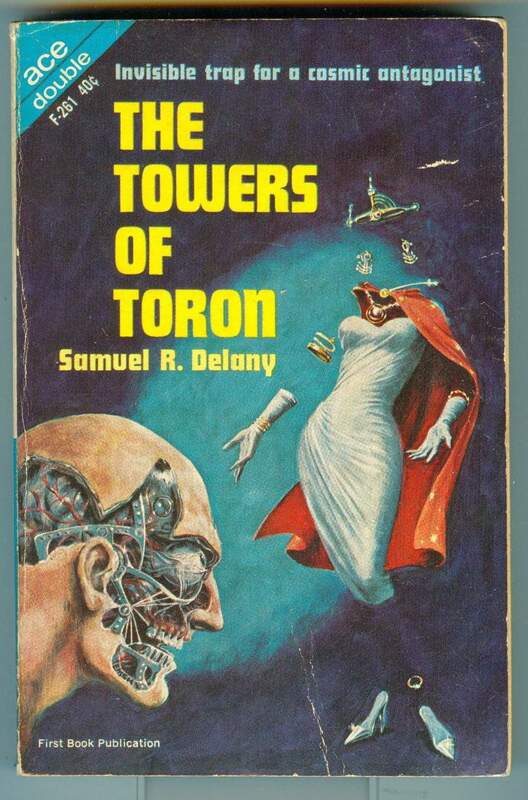 Find out what happens next week on “Towers of Toron”,a Tom Noir production, brought to you by Google, because at Google we KNOW what you like. 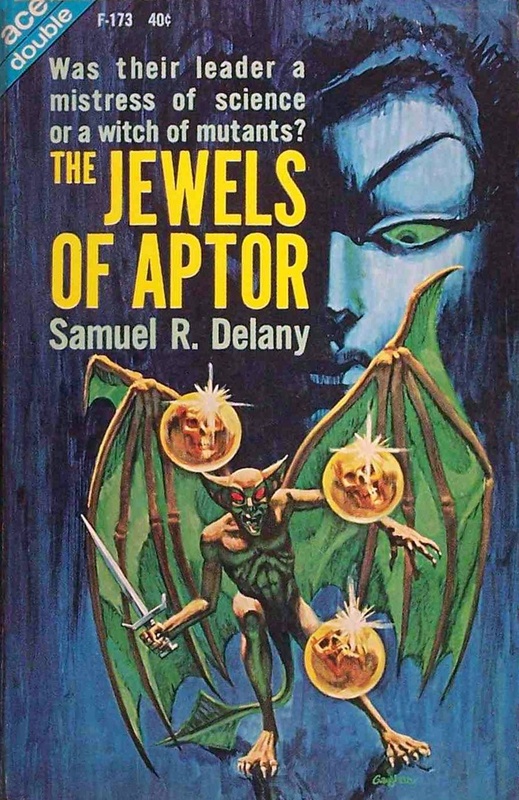 Still, that was back when it was still possible TO depict on the cover the actual content of a Delany novel … if you know what I mean and I think you do. Frankly, given all that is going on with this cover, the stars on the cape is an evil touch of genius. Unknown artist, you say? Look at the guy’s jawbone, and you will see inscribed there “Emsh”. It’s by Ed Emschwiller. Genius artist. This is one of those good-bad covers: beautifully executed, but totally crackers. @Anti-Sceptic: yes, it does. Now, do you have a comment on today’s cover? I always suspected Peter Garrett was a robot. No human could dance like that. 1. Maybe there’s a shadowy blot meant to represent the ring finger, but it really looks as though she has only four fingers on her right hand. 2. Would this image be better, or worse, in whatever sense you use the words, if his eyes were actually popping out of his head? Certainly remove any doubts about the focal point of the gaze. . . .
Hey buddy, her eyes are up… well, actually, I don’t know where her eyes are. @Georgios: “The Dowers of Doron”.